I know what you’re thinking. Another burger cart? When will the ground-round revolution end? Much as I hesitate to write even one more word on Portland’s burgeoning burger scene, this one deserves some recognition. Burgatroyd, Kevin Sandri’s second food cart at North Portland’s Mississippi Marketplace, cranks out an exceptional burger with top grill marks in every category. Honest to god, this is a great burger. Sandri gets his meat from Highland Oak Farms near Salem, where grass-finished antibiotic-free beef is aged for 21 days, then divided into high-end primal cuts for top steakhouses and restaurants like Paley’s Place and scraps for the likes of Sandri, a cook in search of high quality on a food-cart-owner’s budget. Burgatroyd’s basic burger (lettuce, onion, and special sauce aboard a buttery Fleur de Lis brioche bun, $4.50) is excellent. Add-ons ($.25–$1) are truly special, from morel mushrooms with pancetta to homemade sunchoke relish and dill pickles. 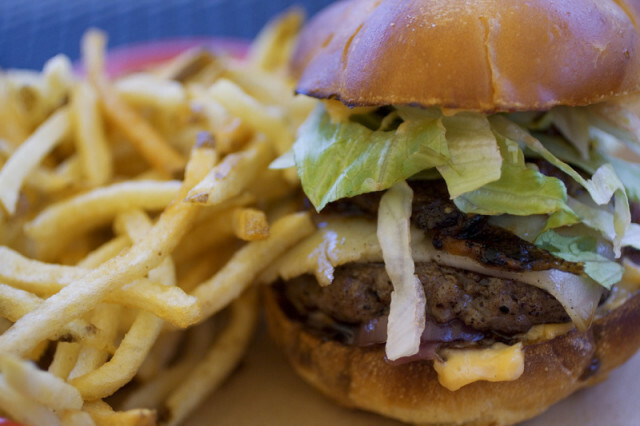 But nothing holds a candle to the Garden State Burger. Though not officially on the menu, ask and you shall receive: it’s grilled to a bloody medium, charged with fatty cow flavors, and slicked with a Calabrian chili aioli, bringing mild garlic undertones and a spicy kick to the table. Add Sandri’s own sweet-pickled onions, musky roasted tomatoes, and a velvety blanket of Provolone picante cheese and you’ve got a Jersey burger in the best way possible. It’s an outright steal at $5.50.